It was in the late 1930’s, when Ellis Whidden opened the right fork to Lost Dog Prairie. On this trip, the Whidden’s camped near a big cypress head on a pine island a few miles in, on what is now Sand Road. That road is the right fork off Monument grade. Monument grade starts at Monument Lake one mile West of Monroe Station on US 41. Monument Grade and Sand Road were tram roads put in by the TREE CHOPPERS that harvested the pine and cypress trees in the 1940’s. Ellis Whidden wanted to open a road on through to Lost Dog and this was the time to do it, he had lots of help, Charlie Benton and a couple others. The Whidden’s had been going out from U.S. 41, north to Buck Skin Prairie, running the prairie up and east, to Lost Dog and then to Lost Dog Swamp where they had a camp. Ellis Whidden was a fearless man always looking for adventure and the last frontier, snakes, alligators, bears and things that made noise in the night didn't scare him. Ellis had a God given gift, he had a built in compass and never got lost. Some said "he didn't know what he was talking about, that camp ain't that way"! "Lets get to opening this road"
It was just daylight good, when they started opening the way through the swamp dodging all the trees they could and cutting the smallest ones just to get the rig through. This was all a virgin woods in those years and the tree choppers hadn't set foot on the land. The big cypress trees and virgin pinetrees hadn't seen an ax or saw. 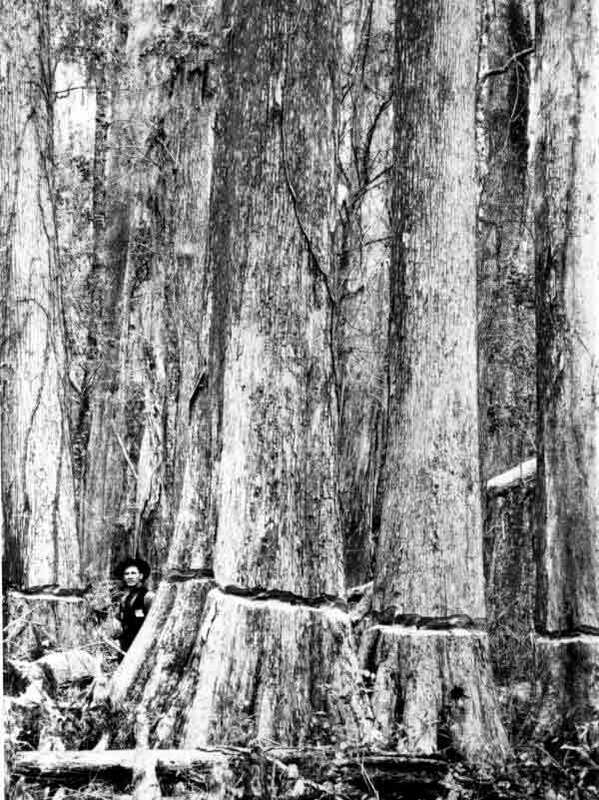 The pines were so high and big you could see through the big pine islands. This land was called Big Cypress, but most called it the Everglades. Most of the roads back then had been made by OX carts. The rig (swamp buggy) was like riding a jackass in a hurricane. It was a 1930 Overland four cylinder, which had that weird overland front end that acted like a road grader when turned to the right or left the front wheels would lean way over. The front wheels were wooden spoke; the drive train was two Chevrolet truck transmissions and a Ford worm drive rear end. On the rear end was mounted six flat truck tires with cleats welded to chains that were welded to the wheels. The rig was rough but there ain't to much it wouldn't crawl through. The Whidden’s named it SCRAMBOLA. When the woods were dry those wood spoke wheels would start squeaking and they would have to pour water on them to make the wood swell up. Later years they got rid of the wood spokes and went to steel rims. This rig was so rough that only the driver would ride, the others walked. 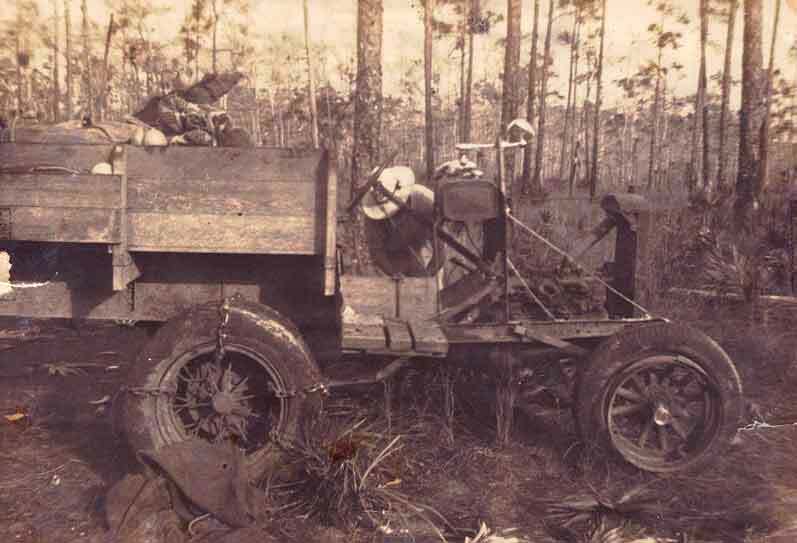 This was one of the first swamp buggies to cross Buck Skin and Lost Dog Prairie. "Keep going boys. we are almost there"! It was getting late and the sun was setting. All but Ellis feared they were hopelessly lost. All of the men were tired and hungry. They were all walked and chopped out. Ellis recognized the cypress heads of Lost Dog Swamp and told one of them to walk out on the edge of the open woods ahead. "If you don’t find a set of buggy ruts, (this buggys ruts), we will camp here". "If you find the road, then we will be at camp in about 15 minutes". The tired man staggered out that way and in a little while came running back yelling, "they are there, they are there, lets get to camp". Those grim faces turned to smiles and all got a second wind. Ellis wasn't lost after all. After the Whidden road was open, buggies started following it and got it wallowed out. Sand road runs close to where the Whidden road was made. The Whidden’s had several camps in the Big Cypress: Lucky Camp, north of Buck Skin, Waukesha Camp, Whidden Camp and Buck Ridge Camp. Ellis Whidden was bigger than life. He enjoyed the Everglades to the fullest it was always home to him. He knew many of the old timers of the Big Cypress like: Old Man Hamilton, Joe Lord, Smoot Johnston, Simon Hogan and many others. If you are ever out on Lost Dog at night and a friendly cool breeze is whispering through the saw grass and cypress it may be Ellis Whidden. I think his spirit lingers in those woods. This story is dedicated to the memory of Ellis B. Whidden. My Father (Ellis Whidden) told this story many times as we traveled through the swamp or sat by the campfire. He was a great Father that taught me to respect the Big Cypress.